Uttarakhand Medical Service Selection Board has announced UKMSSB Recruitment 2018 Notification for 138 Assistant Professor posts. Candidates who are interested and eligible can apply online for UKMSSB Assistant Professor Recruitment 2018 till 26th October 2018. The Online Registrations for Assistant Professor Vacancies has started from 27th September 2018. Aspirants may read complete details about the selection process, eligibility criteria, etc for UKMSSB Dehradun Jobs 2018 from here. What is the Eligibility Criteria, Pay Scale & Selection Method for UKMSSB Recruitment 2017 – 18 ? What is the Age Criteria For UKMSSB Recruitment 2017 – 18 ? How much Application Fee required for UKMSSB MO Online Form ? How I Fill Online Form for UKMSSB Recruitment 2017 –18 For Ordinary Grade Medical Officer Jobs ? How Can I Apply For UKMSSB Recruitment 2016 –17 Surgeon Bharti? 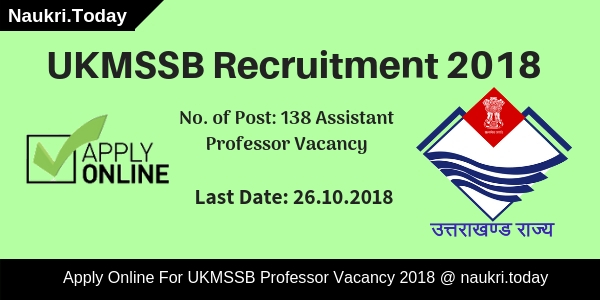 Fresh Update as on 12.10.2018: Hello Friends, UKMSSB has issued notification for 138 Assistant Professor Vacancies. Aspirants who are seeking for government job may apply for UKMSSB Recruitment 2018. Last Date for online Registration is 26.10.2018 for UKMSSB Assistant Professor Vacancy 2018. 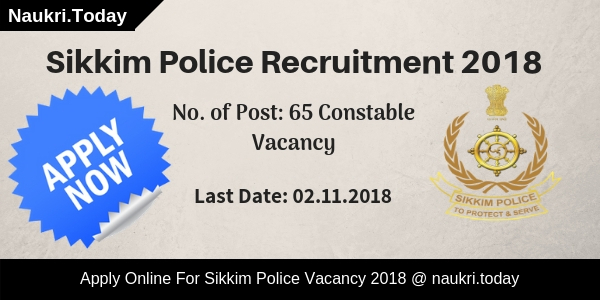 Fresh Update as on 04.10.2018: Online registration for UKSMSSB Recruitment has already started. Candidates may fill up their application form before the last date. Here we provided you complete details regarding UKSMSSB Vacancy 2018. Candidates may apply online form links given here for UKSMMB Assistant Professor Jobs 2018. Candidates should have Medical Qualification as per latest MCI-TEQ Regulations for UKMSSB Assistant Professor Jobs 2018. Candidates may refer UKMSSB Notification to check more details about qualifications for Assistant Professor posts. Aspirants must have minimum age as 30 years and maximum age as 45 years for UKMSSB Recruitment 2018. Relaxation in maximum age will get applicable for reserved categories as per department rules and regulations. Participants will get selected on the basis of Interview for UKMSSB Assistant Professor Recruitment 2018. For more information regarding the selection method for UKMSSB Recruitment, you can read the official notification. Selected applicants will get paid by pay matrix level-10 for UKMSSB Assistant Professor Recruitment 2018. For Assistant Professor post, Department will offer Rs. 56100/- to Rs. 177500/- per month. Participants should click on UKMSSB Dehradun Recruitment Notification Link. Read the complete information as available on UKMSSB Dehradun Assistant Professor Recruitment Advertisement. Eligible participants must click on Apply Online Link. Fill up the correct and full information in UKMSSB Online Application Form. Candidates should upload the scanned images of their passport size photo, relevant subjects and signature in online form. Aspirants must also deposit application fee through online mode. Recheck your filled UKMSSB Dehradun Online Application Form. Then candidates can click on Submit button. You should also take a hard copy of submitted UKMSSB Assistant Professor Online Form for their future use. Conclusion: UKMSSB Recruitment 2018 Advertisement is out for 138 Assistant Professor posts. The last date for submission of UKMSSB Dehradun Assistant Professor Recruitment 2018 before on 26.10.2018 (11:59 PM). Are you searching Jobs in Uttarakhand State ? ?, If yes then here is a important news for you. Uttarakhand Medical Service Selection Board has announced notification of 712 Ordinary Grade Medical Officer Vacancy. All the job seeker who is interested in UKMSSB Recruitment 2017 – 18 can fill the application form through online mode. Submission of application form for UKMSSB Medical Officer Vacancy started from 06.09.2017. Closing Date for applying online form for Uttarakhand Medical Officer Recruitment is 20.10.2017 (extended till 30.11.2017). UK Medical Service Selection Board is inviting online form for recruiting candidates on 712 MO Vacancies. Appliers who are waiting for Medical Department in Uttarakhand they can fill online form for UKMSSB MO Vacancy 2017. Before filling online form for candidates must check “What is the Required Qualification for Uttarakhand Medical Services Vacancy ??”. To get more information about UKMSSB Recruitment you can get from below article. Fresh Update (03.11.2017) : Dear Applicants, here is news for you. Uttarakhand Medical Service Selection Board has increased the date to apply Online for UKMSSB Recruitment 2017. Now, the Last Date to fill the application form for Uttarakhand Medical Service Jobs is 30.11.2017. Candidates you can get full information about Qualification, Age Limit, Fees, Pay Scale & Selection Criteria For UKMSSB MO Vacancy 2017 from here. Applicants must read the below article, by reading the below sections you can get full details about Uttarakhand Medical officer Bharti 2017. Appliers must have done MBBS degree or any equivalent qualification in respective trade from any recognized University. More information about Education Qualification for UKIMSSB Vacancy you can check from official UK Medical Service Selection Board Notification, which is mention below. Minimum age of the applicants for UKMSSB Medical Officer Jobs should be 21 years & upper age must be 42 years as on 01.07.2017. Relaxation in age for Uttarakhand Medical Department vacancy is applicable only for reserved category applicants as per Department rules & regulation. Selection applicants for UKMSSB Vacancy 2017 will paid pay band as per Department Norms. At Starting, Selected applicants will paid Rs. 56,100/- to 1,77500/- per month under Level – 10 Pay Matrix for Medical officer Jobs. Candidates of General category need to pay Rs. 2000/- as application fee for UK Medical Officer Vacancy 2017. Other category applicants of SC/ST/ PWD/ESM of UK State need to pay Rs. 1000/- for filling online form for UKMSSB Jobs 2017. Candidates will selected for UKMSSB recruitment 2017 – 18 on the basis of Interview. If a large no. of application received for Medical officer Vacancy, Department will conduct Screening/ Written Examination for selection qualified candidates on Uttarakhand Medical Department MO Vacancy 2017. For more information about Selection criteria you can check official advertisement & keep visit this page for more updates related to UKMSSB Jobs 12017. First of all candidates log on to the official website www.ukmssb.org. Now click on official UKMSSB Recruitment Notification link. Deposit application fee & click on submit online form. Conclusion:- UKMSSB recruitment 2017 – 18 For 712 Ordinary Grade Medical Officer Jobs. candidates can film online form for UKMSSB Vacancy on or before the last date. that is 20.10.2017 is extended till 30.11.2017. Uttarakhand Medical Department has recently published a notification for 203 Dental Surgeon Vacancy. Candidates who are looking for UKMSSB Recruitment 2016 should apply application in prescribed format. Eligible applicants can submit application form for UKMSSB Dental Surgeon Jobs 2016 on or before the last date 05.11.2016. Uttarakhand Medical Service Selection Board (UKMSSB) has released 203 Dental Surgeon Vacancy in Medical Department. Applicants who are waiting for UKMSSB Bharti 2016-17 have a good opportunity to apply application form. To get other information about UKMSSB Vacancy like Age Limit, Education Qualification etc. you can check below details. Education Qualification: Applicants should have done Degree in Dental Surgeon Course/ B.D.S. Course or equivalent for UKMSSB Bharti 2016 –17. Candidates who are going to apply for UKM<SSB Dental Surgeon Vacancy 2016 must have done qualification from recognized university. Age Limit For UKMSSB Dental Surgeon Application form: Age of the candidates should be in between 21 years to 42 years as on 01.07.2016 for UKMSSB Vacancy. age relaxation will be applicable as per Govt. Norms for Uttarakhand Medical Department Surgeon Vacancy 2016 –17. UKMSSB Recruitment 2016 Application Fee: Candidates who are belonging from General/ OBC Category should be paid Rs. 2000/- for Uttarakhand MSSB Recruitment 2016. All other category candidates of Uttarakhand State should be paid Rs. 1000/- for UKMSSB Surgeon Jobs 2016. Pay Band for UKMSSB Jobs 2016: Selected candidates will be paid pay band Rs. 15,600/- to 39,100/- with grade pay Rs. 5,400/- for Dental Surgeon Vacancy in Uttarakhand Medical Department. Uttarakhand Medical Dept. Surgeon Jobs Selection Process: Selection Process of the candidates for UKMSSB Recruitment 2016 will be on the basis of Personal Interview Basis. Candidates who are looking for UKMSSB Dental Surgeon Bharti 2016 should apply application before the last date. Check the given instruction before apply application. applicants first of all log on to the official website. After that click on UKMSSB Surgeon Vacancy Notification link. Read all the information from notification carefully. Now click on download Application form. Make all the information correctly in form. Attach photo & required a document with the application form. Deposit application fee & Attach copy with the application form. Recheck all details & Send the application on the correct postal address. Conclusion: UKMSSB Recruitment 2016 –17 for 203 Dental Surgeon Vacancy. Candidates can apply for Dental Surgeon vacancy in UKMSSB on or before the last date 05.11.2016.